An amazing thing happened at our Lifestyle of Achievement Global Summit last month through the efforts of Perry Rhue. 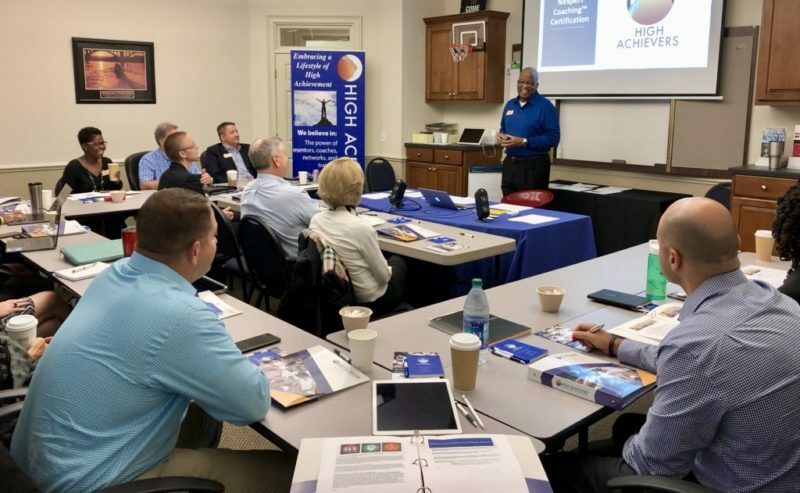 Perry is the leader of our High Achiever’s Network® of expert business coaches that is quickly growing to over 30 coaches before the end of this year. At our Summit, we trained and certified over 17 Nexpert coaches so that we could provide our members with the best business coaching possible. We know that being a solo operator, entrepreneur, or small business owner is an incredibly rewarding path to follow, but sometimes it can also be very lonely. You had a vision, and there is a reason you chose this path where you called the shots and hit your goals. Somewhere along the way though we all run into issues and face challenges that impede our progress or deter us from our path. High Achievers understands the challenges and opportunities we all face and is coming alongside local business people like you, helping them take their business to the next level and Embrace a Lifestyle of High Achievement™. We do that by providing our members three levels of membership. The first level is our Essential Business Training that will allow you to fill the gaps in your knowledge and build the skills you need to reach your business and personal goals. The second level of membership is our Catalyst Mastermind Groups™, which bring together like-minded business people to use shared wisdom to face their challenges, take action, have accountability, and build the business of their dreams. The third level of membership is our Nexpert Coaching™ Program where we pair our members with a coach whose area(s) of expertise is in the member’s specific business need/challenge rather than matching members with a coaching generalist. Our members also can switch from specialty coach to specialty coach (or “Next Expert Coach”) as needed throughout the entire coaching engagement. The way High Achievers is going about delivering business coaching allows solopenures, entrepreneur and local business development professionals to get the coaching they need. Our team has built the membership levels in such a way that the technology and scalability allow us to provide all three membership levels so they will fit inside of your budget. Not only that but because we care to come along beside local business owners and to provide them with education, wisdom, and guidance the impact we are making for them, and their communities have been beyond what we thought possible. For years the business coaching industry has ignored a whole segment of business ownership. Has created an environment where the business owner that needs the most guidance has too few options to succeed. No longer do you have the face the future alone. Most small business owners believe that the only help they have is from shadowing, government based groups, or education that may be out of reach for time or budget reasons. No longer do you have to live of Hopepium and pray that you make it to the next quarter. For the same purposes you struck out on your own we created our three levels of membership so we could create an environment where you could get the guidance and help you need. Each level of membership stacks on top of each other and each member can choose the level of membership that meets their needs and fits the budget they are looking for as they Embrace a Lifestyle of High Achievement™. 3.5 hours once a month the member meets with our local business owners to learn the basic building blocks of business ownership. This curriculum and the order in which it was in was created using experts on each topic in a systematic way that ensures success for our members. Each month you will learn the skills that help you fill the gaps and help you know the right steps to make. You will also come away from each session with action steps to a plan to adjust and overcome the most significant issues you face as a business owner and entrepreneur. 3.5 hours a month you meet with a small group of business owners just like you. The members of your group will more than likely bee on the same journey you are and each month the group helps you take the next step in your journey. Unlike most mastermind groups you have a set agenda that will bring out the best information for each member and allow each to overcome their most considerable challenges and have tactics in place so that he or she do not miss opportunities. Our groups are lead by a Chairperson who is there to help the structure and information flow. We focus on shared wisdom, accountability, gratitude, taking action and behavior based accomplishment. Our Catalyst Mastermind Groups members also benefit from having access to our robust cloud-based business coaching platform that allows them to track goals, actions, and learnings so they can get the most from their group. Also, this level of membership stacks on top of the Essential Business Training, and you will have full access to all of the training materials and classes. 2 hours of one on one business coaching and guidance from a specialized coach. This level of membership is backed up by our High Achiever’s Network® of coaches that are expert in one to areas of business. We do not have any generalist on our team. The common mistake by business owners is to find a business coach, and they assume that coach will have all the answers by alone. As we were building our High Achievers Network™, we understood that general answers and no action steps would not provide the guidance that was needed. Most of our clients prefer the step by step action steps and accountability that our network provides them. We now have over 130 areas of expertise we are helping our clients with, and that grows every month. As with the Mastermind level of membership, if you select this membership level, it stacks on top of the Catalyst Mastermind Groups and the Essential Business Training giving you access to all three levels of membership. www.HighAchievers.com then click on Member Login to register.